The history of most U.S. health systems go back decades, with deep roots in their communities and broader regional influence. Generations of employees, patients, volunteers and other stakeholder groups have rich and poignant memories of births, deaths, times of illness and health and careers associated with these institutions. Hospitals and larger health systems are community hubs, major regional employers and enduring symbols of community pride. In larger markets, the amount of M&A activity can be dramatic. The illustration below shows the Chicago healthcare market, a dense competitive landscape which is thinning due to the prevalence of M&A activity that has accelerated over the last three years. Competitors are becoming larger and threatening to become stronger as post M&A integration happens. The illustration also identifies the post-merger branding approach taken in each case. In this context, the merger and potential rebranding of a hospital system at its best, will be a major event to be scrutinized, and at its worst can be a traumatic event in the life of a community. As a result, the approach to rebranding, the pace of rebranding and the brand implementation itself are all critical, both in terms of the short-term optics after a merger and the longer-term brand strategy, that if done well will unlock the value and potential of the merger. So when deciding on a new post M&A brand identity, which approach should an organization be applying to increase the probability of a successful M&A result? Based on research conducted by Type 2 Consulting, they found there are three common brand strategy approaches, each with its distinct set of Pros and Cons. 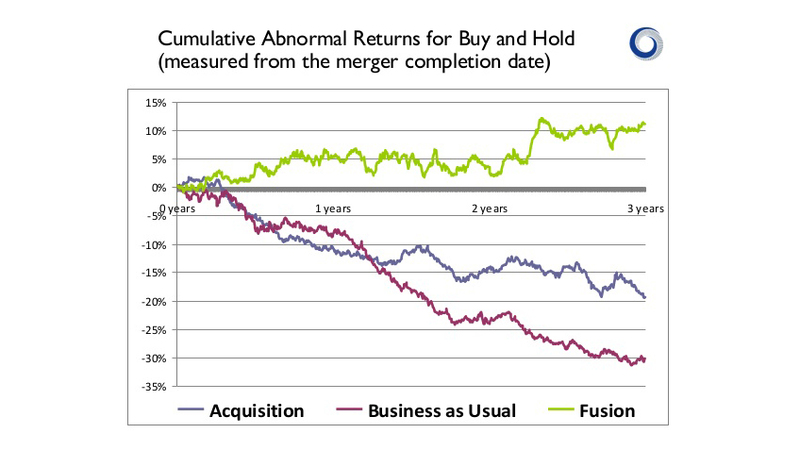 Three common options of merging companies are: Fusion, Assimilation and Business as Usual. Fusion: The corporate brand incorporates elements from both brands. Although each can be valid to consider, given the specific context of the transaction, according to at least one ground breaking study, there is one that is significantly more effective than the others: Fusion branding. • Assimilation – fell short of the market return by minus 15 percent on average. This suggests that the explicit attention that a Fusion brand strategy approach pays to the combination of the two merging entities may play an important role in facilitating the post-merger integration process. While the thinking around M&A so often appears to be dominated by cost synergies, these research results are a good reminder of the importance of brand, customer and employee equity in ensuring the success of a merger. The success of a Fusion Branding approach may in large part be attributable, by definition, to the more collaborative approach it creates, and also the degree of acceptance by the community at large involved by preserving both brand’s equities. To get the most out of a M&A investment, to connect with and/or attract patients, healthcare professionals, and the communities they serve; hospitals must build and leverage one of their most important business assets: their brand. Please also refer to our more detailed white paper “Successful Healthcare Provider Mergers & Acquisitions: The Key Roles of Branding & Brand Implementation” and stay tuned for future blogs to discuss the pace of rebranding and various phases of brand implementation. What post-merger strategies has your healthcare organizations used in the past? Which of these recommended strategies would make an impact after your next merger? Let us know in the comments below and subscribe to receive the latest Shikatani Lacroix insights in your inbox.